I asked on a CCN forum, phoned around and met for coffee with a few local celebrants who indicated they were willing to be contacted if I needed to hand a ceremony to them or who could be contacted in an emergency. We then became a little network for each other and were able to come up with some emergency steps which were reassuring for ourselves and for clients. Where there is plenty of warning, one celebrant can transfer the Notice of Intended Marriage to another. The transferring celebrant writes on the form that it has been transferred to XYZ celebrant adding a date and signature. 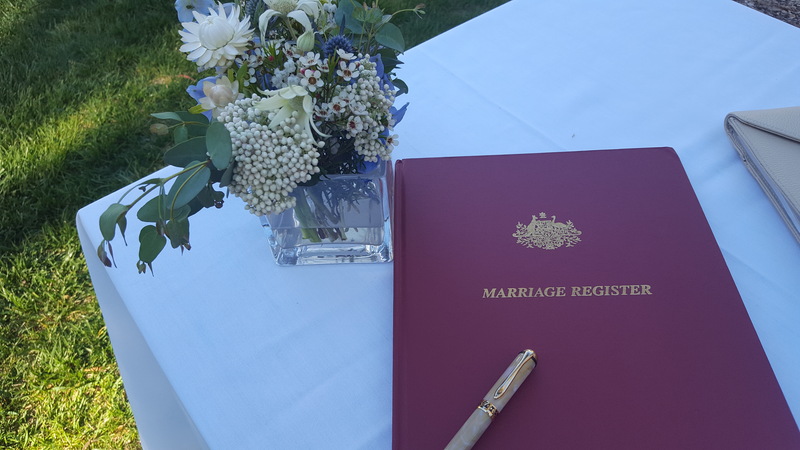 It's then the responsibility of the original celebrant to transfer the notice safely - by hand or registered post to XYZ celebrant who must then sight the originals of all documents proving date and place of birth and end of previous marriages. XYZ celebrant would then proceed to prepare the other documents - the Declaration of No Impediment and the three marriage certificates. Having the little network of colleagues has meant there have been a number of occasions where we have been able to transfer a ceremony to another in this way. For emergency situations where there is no warning, we drew up emergency cards which we could place on the front seat off the car, in transit to marriage ceremonies or rehearsals. Our cards were similar and mine indicated in large bold print, that I was a marriage celebrant on the way to a marriage ceremony, where to find the couple’s marriage details (e.g. in the cream folder in the leopard print bag), contact details for the other celebrants in emergencies and personal / next of kin emergency contact details. Where a serious injury or accident takes place at the last minute, hopefully another celebrant can be contacted using the emergency card. That celebrant can take a couple of courses of action. First they could stand up in front of the couple and guests, introduce themselves and indicate that because of the emergency situation they are today performing a commitment ceremony and that the legal parts of the a marriage will take place at another time. The celebrant would proceed with the ceremony as written, including rings and rituals, but omitting the Monitum, the legal vows and any pronouncement that the pair were a married couple. Alternatively, if there is time, (45 minutes to an hour would be comfortable), if it is possible to have the original NoIM transferred, sight the couple’s date and place of birth and previous marriage documents - the new celebrant could quickly fill out by hand, a new set of forms (the Declaration of no Impediment and the three marriage certificates using the new correct details.) I keep a complete set of blank forms with my presentation folder for this scenario which I hope I never have to use. I think this would be quite a cumbersome process. Plan B for the couple usually relates to them having an alternative location in case of bad weather. This is something for the celebrant to discuss with them early in the planning process. I now also ask the pair to consider what they will do if there is no shade in the outdoor location and the temperature is going to be over 35 degrees. This has been very useful on the very few occasions I have had to use it. The best illustration of this was when I called the emergency contact (the mother of the bride), 15 minutes before the start of the ceremony, told her that it was raining, not just spitting and that I had just asked the guests to take the 50 chairs under cover. She relayed the change and the new location to the wedding party and everything worked soothly.